"Worriers" redirects here. For band, see Worriers (band). For other uses, see Worry (disambiguation). A depiction of Rama in the Ramayana. Worried about his wife Sita, he is consoled by his brother Lakshmana. Worry refers to the thoughts, images, emotions, and actions of a negative nature in a repetitive, uncontrollable manner that results from a proactive cognitive risk analysis made to avoid or solve anticipated potential threats and their potential consequences. Worry is described as a response to a moderate challenge for when the subject has inadequate skills. Worry turns to be problematic if one has been excessively apprehensive more days than not for at least six months. A young girl looking worried. Psychologically, worry is part of Perseverative Cognition (a collective term for continuous thinking about negative events in the past or in the future). As an emotion "worry" is experienced from anxiety or concern about a real or imagined issue, often personal issues such as health or finances, or external broader issues such as environmental pollution, social structure or technological change. It’s a natural response to anticipated future problems. Excessive worry is a primary diagnostic feature of generalized anxiety disorder. Most people experience short-lived periods of worry in their lives without incident; indeed, a mild amount of worrying have positive effects, if it prompts people to take precautions (e.g., fastening their seat belt or buying insurance) or avoid risky behaviors (e.g., angering dangerous animals, or binge drinking), but with excessive worrisome people they overestimate future dangers in their assessments and in its extremities tend to magnify the situation as a dead end which results stress. Overestimation happens because analytic resources are a combination of external locus of control, personal experience and belief fallacies. Chronically worried individuals are also more likely to lack confidence in their problem solving ability, perceive problems as threats, become easily frustrated when dealing with a problem, and are pessimistic about the outcome of problem-solving efforts. Seriously anxious people find it difficult to control their worry and typically experience symptoms like Restlessness, Fatigue, Difficulty in concentrating, Irritability, Muscle tension and Sleep disturbance. 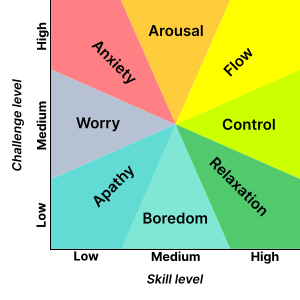 The avoidance model of worry (AMW) theorizes that worry is a verbal linguistic, thought based activity, which arises as an attempt to inhibit vivid mental imagery and associated somatic and emotional activation. This inhibition precludes the emotional processing of fear that is theoretically necessary for successful habituation and extinction of feared stimuli. Worry is reinforced as a coping technique due to the fact that most worries never actually occur, leaving the worrier with a feeling of having successfully controlled the feared situation, without the unpleasant sensations associated with exposure. This model explains pathological worry to be an interaction between involuntary (bottom-up) processes, such as habitual biases in attention and interpretation favoring threat content, and voluntary (top-down) processes, such as attentional control. Emotional processing biases influence the probability of threat representations into the awareness as intruding negative or positive thoughts. At a pre-conscious level, these processes influence the competition among mental representations in which some correspond to the assertive power of worry with impaired cognitive process and others to the preventive power of worry with attentional control or exhaustive vigilance. The biases determine threatening degree and nature of worry content the worrier attempts to resolve the perceived threat and the redirection of anticipations, responses and coping in such situations. There are some who respond to mental representations in an uncertain or ambiguous state in regard to the stressful or upsetting event. In this state the worrier is held in a perpetual state of worry. This is because availability of an overwhelming number(maybe 2 or 3, depending upon the worry-prone individual) of possibilities of outcomes which can be generated, it puts the worrier in a threatening crisis and they focus their attentional control voluntarily on the potential negative outcomes, whereas others engage in a constructive problem solving manner and in a benign approach rather than to engage with heightened anticipation on the possible negative outcome. Greek thinkers such as stoic philosopher Epictetus and Seneca advised against worry. Albert Ellis, the inventor of cognitive behavioural therapy, was inspired by the Stoics’ therapeutic ideas. Guido Reni's 17th-century painting of John the Baptist depicts anguish and worry. For God did not give us a spirit of cowardice, but rather a spirit of power and of love and of self-discipline. Worry system is activated from exposure of a potential triggering event, traumatic experience or vulnerability, this brings worrisome thoughts and feelings which bring about physical stress reactions and response to avoid worrisome behavior, to ensure allostasis. But under the crisis this activity feeds back into the first worrisome thoughts and feelings which generates and strengthens the vicious worry cycle. Relaxation, risk assessment, worry exposure and behavior prevention have been proven effective in curbing the excessive worry, a chief feature of generalized anxiety disorder. Cognitive behavioral techniques hasn't branched out enough to address the problem holistically but therapy can control or diminish worry. ^ Borkovec TD. (2002). Clinical Psychology: Science and Practice 9, 76–80. ^ Brosschot, J.F. ; Pieper, S.; Thayer, J.F. (2005). "Expanding Stress Theory: Prolonged Activation And Perseverative Cognition". Psychoneuroendocrinology. 30 (10): 1043–9. doi:10.1016/j.psyneuen.2005.04.008. PMID 15939546. ^ Bredemeier, Keith; Berenbaum, Howard (2008-01-01). "Intolerance of uncertainty and perceived threat". Behaviour Research and Therapy. 46 (1): 28–38. doi:10.1016/j.brat.2007.09.006. PMID 17983612. ^ Borkovec, T. D.; Alcaine, O.M. ; Behar, E. (2004). Generalized anxiety disorderL advances in research and practic. Guilford Press. pp. 77–108. ^ Gillihan, Seth J.; Foa, Edna B. (2011). Associative Learning and Conditioning Theory. pp. 27–43. doi:10.1093/acprof:oso/9780199735969.003.0017. ISBN 9780199735969. ^ Behar, Evelyn; DiMarco, Ilyse Dobrow; Hekler, Eric B.; Mohlman, Jan; Staples, Alison M. (Dec 2009). "Current theoretical models of generalized anxiety disorder (GAD): Conceptual review and treatment implications". Journal of Anxiety Disorders. 23 (8): 1011–1023. doi:10.1016/j.janxdis.2009.07.006. PMID 19700258. ^ R.H, Colette; Mathews, Andrew (2012). "A cognitive model of pathological worry". Behaviour Research and Therapy. 50 (10): 636–646. doi:10.1016/j.brat.2012.06.007. PMC 3444754. PMID 22863541. ^ Koerner, Naomi; Dugas, Michel J. (2006-01-01). Davey, Graham C. L.; Wells, Adrian, eds. A Cognitive Model of Generalized Anxiety Disorder: the Role of Intolerance of Uncertainty. John Wiley & Sons Ltd. pp. 201–216. doi:10.1002/9780470713143.ch12. ISBN 9780470713143. ^ Robichaud, Melisa (2013-01-01). "Generalized Anxiety Disorder: Targeting Intolerance of Uncertainty". In Simos, Gregoris; Hofmann, Stefan G. CBT for Anxiety Disorders. John Wiley & Sons Ltd. pp. 57–85. doi:10.1002/9781118330043.ch3. ISBN 9781118330043. ^ O'Leary, T. A., Brown, T. A., & Barlow, D. H. (1992). The efficacy of worry control treatment in generalized anxiety disorder: A multiple baseline analysis. Association for Advancement of Behavior Therapy, Boston. ^ Zinbarg RE, Barlow DH, Brown TA, Hertz RM. Cognitive-behavioral approaches to the nature and treatment of anxiety disorders. Annu Rev Psychol. 1992;43:235-67. Look up worry in Wiktionary, the free dictionary.